Learn how easy it to spatchcock a chicken – step by step! 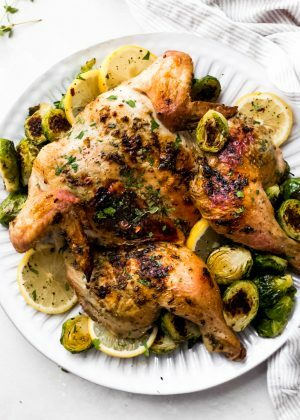 My roasted herb butter spatchcock chicken is fancy enough to serve dinner guests and perfect for meal prepping on Sunday for weeknight dinners! 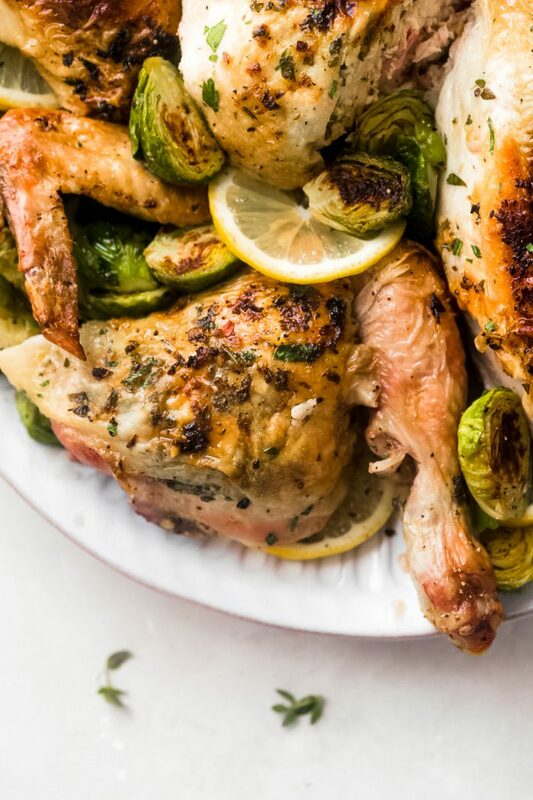 It sounds super fancy, but honestly, it’s as simple as removing the backbone of the chicken, smearing on a garlic and herb butter and roasting the chicken until the skin is beautifully golden and crisp. And this happens to be one of those meals that you can and should put together for your significant other on V-DAY. 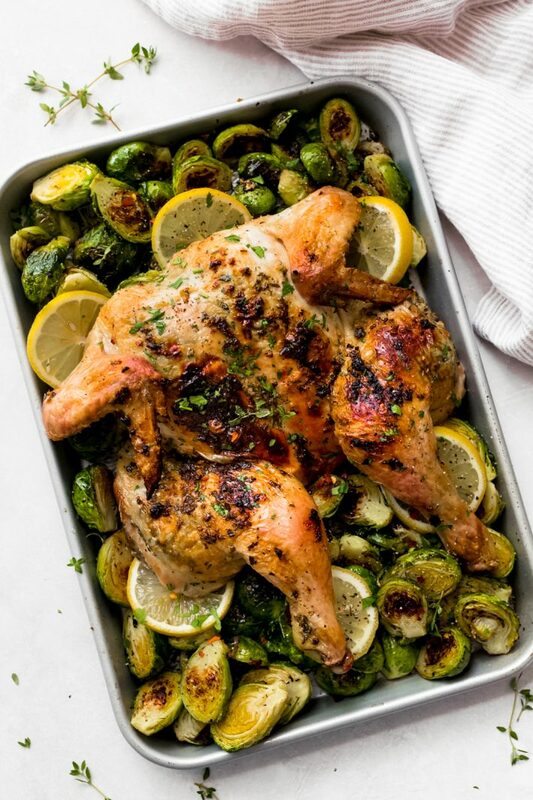 In the past, I’ve shared a one-hour roasted chicken  recipe with you, but ever since I’ve discovered spatchcock chicken, I’ve sorta hopped on this train and haven’t gotten off yet. 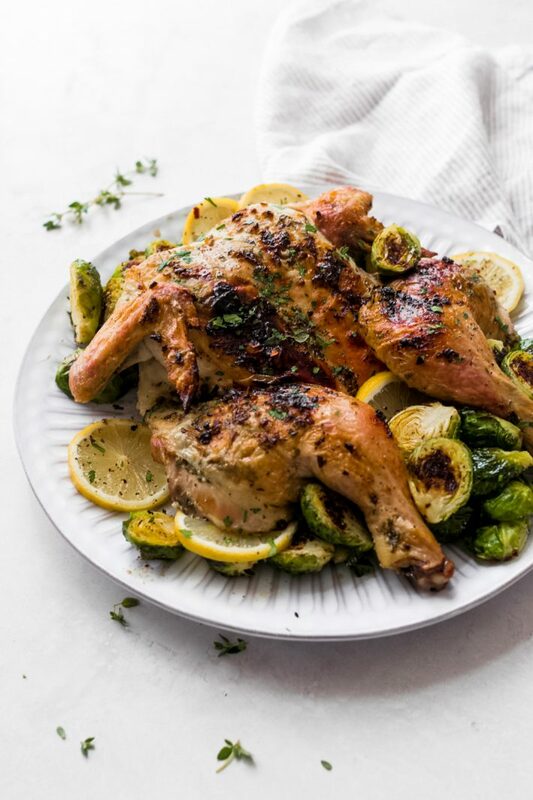 It’s so much easier than making a traditional trussed roast chicken, and the roast is so much more even! A whole roasted chicken can be tricky to make. Sometimes the chicken breasts dry out if we aren’t making sure to check the temperature carefully. This is why most people prefer to pick up rotisserie chickens from Costco or their local grocery store instead of roasting a whole chicken at home. 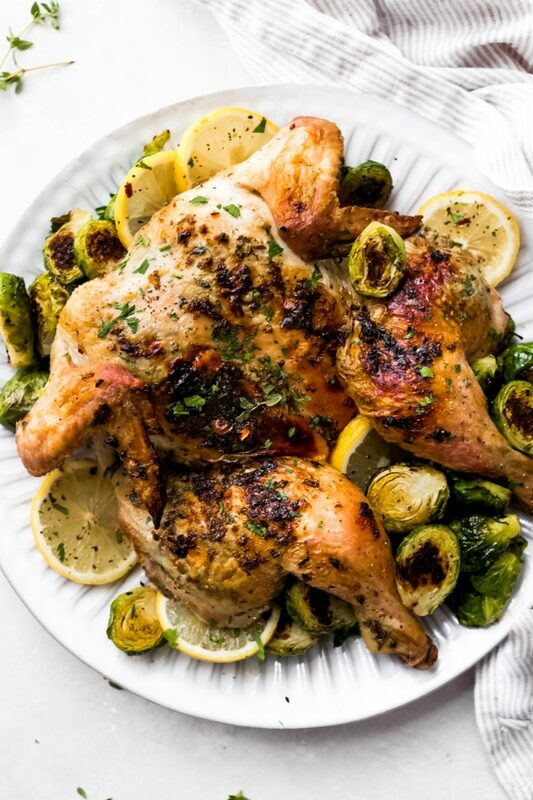 When you butterfly – or spatchcock a chicken, the chances of the chicken breast overcooking are significantly reduced because everything is on a leveled field, leaving you with a more delicious, evenly roasted chicken. And trust me, a homemade roasted chicken tastes far superior to anything you’ll get at a grocery store! Simply put, it’s removing the spine (or the backbone) of the bird (or butterflying it) and pressing down the sternum (breast bone) until it cracks and the chicken is laid out entirely flat. Have you heard of brick chicken? You know, where you place a brick wrapped in foil on the bones (pressing the flesh down on the grill) and cook the chicken that way? Well, once you learn to spatchcock a chicken, the possibilities are truly endless! 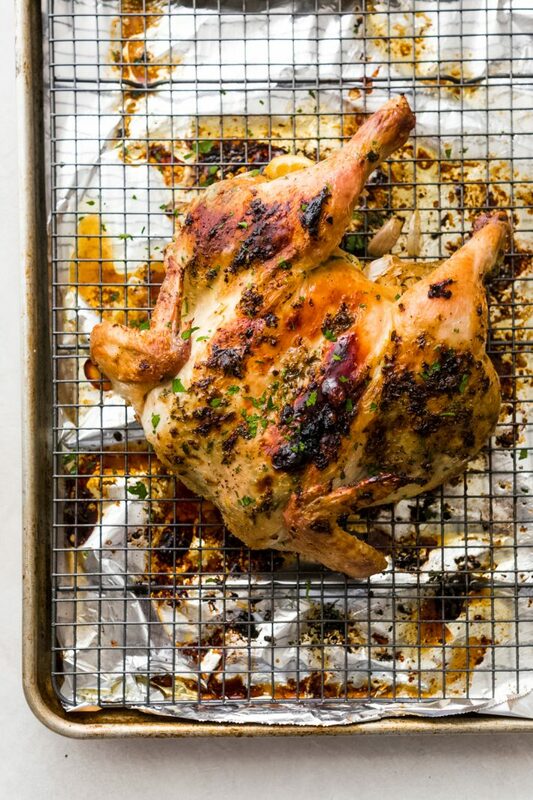 WHAT EQUIPMENT DO I NEED TO ROAST A PERFECT SPATCHCOCK CHICKEN? Remove the backbone and save it to make stock later! You don’t need kitchen twine or anything fancy! I have the most distinct memories of trussing the Thanksgiving turkey with my dad every year. My mom would let us do it, way too big of a beast for her to deal with alone. So dad and I would put on the Good Eats Alton brown turkey trussing video (seriously a lifesaver) and my younger sister would pause and play for what seemed like an eternity until we’d both managed to wrestle the bird into something that would pass as decent. It’s easier to season more evenly. One of the things I hate most about a trussed chicken is the fact that you have to reach into the cavity of the bird to make sure the inside is adequately seasoned. It’s cold, and it feels weird! With the cavity exposed, it’s easy to season; I don’t think twice about it. You get crispy, more evenly baked chicken. With the backbone attached, it takes much longer to roast a bird. 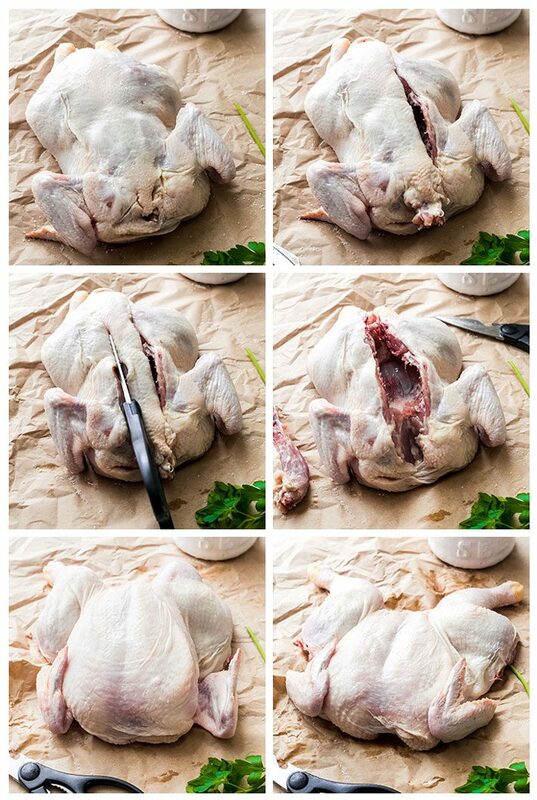 Once you remove the spine, you chicken cooks faster and more evenly! Just take a look at my one hour roasted chicken recipe. I use a 3 ½ pound bird the requires 45 minutes to roast and yet, here we’re using 4 ½ pounds, and it requires the same amount of time! WHAT DO I NEED FOR THE HERB BUTTER RUB? Once you have a spatchcock chicken, salt it all over the skin and the underside and allow the chicken to rest for 45 minutes at room temperature. This allows the salt to penetrate through the skin and season the chicken more evenly. Also, it prevents the chicken from steaming in the oven. Loosen the skin of the chicken, and gently dot it with half of the prepared herb butter. Rub the remaining half of the herb butter on the skin itself. Roast the chicken for 40-45 minutes or until the chicken reaches 156-158ºF on an instant read thermometer. The chicken will continue to cook for another 7-10º when you allow it to rest. If possible spatchcock the chicken and season with salt, cover and refrigerate the chicken overnight. This will allow the salt to penetrate the skin and get all the way down to the meat. If you do this, you can cut the salt in the herb butter back to 1/4 teaspoon. If crispy roasted skin is important to you (is there anyone that doesn’t prioritize this?) make sure you don’t cover the chicken when you pull it out of the oven and allow it to rest. Tenting the chicken will cause the skin to steam and make it less crispy. PREP: Place the chicken on a clean surface and pat the chicken dry using paper towels. Flip the chicken breast side down. Use sharpened kitchen shears, with the neck side towards you, find the spine and cut on both sides of the spine, making sure you don’t remove excess meat. Remove the spine and save it to make stock later! Flip the bird over so it’s breast side up and use your palms to press down the sternum (breast bone) with force so it cracks and the breast and legs lay flat on the surface. Season the chicken with 1 teaspoon of kosher salt on both sides. Place the chicken breast side up on a wire rack (placed on a baking sheet lined with foil or parchment.) let the chicken hang out for at least 35-45 minutes at room temperature if time permits, this will undoubtedly yield better results. Position a rack in the center of the oven and preheat the oven to 425ºF. HERB BUTTER: Combine the softened butter with the garlic, thyme, lemon juice/zest, ½ teaspoon salt, pepper, and 1 tablespoon of parsley. Smash with a fork until well mixed. 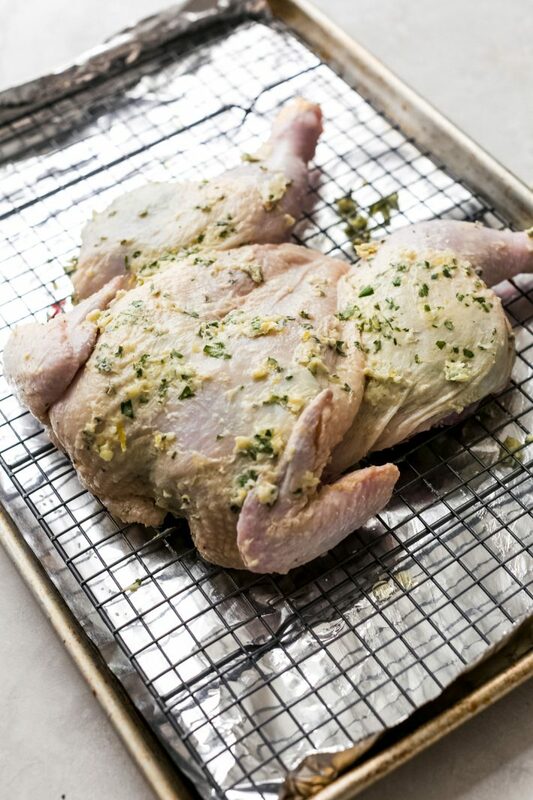 Lay the spatchcocked chicken on a flat surface and gently raise the skin and dot about ½ of the prepared herb butter. Spread the remaining butter all over the chicken. BAKE: the chicken uncovered for 40-45 minutes or until an instant read thermometer registers at 156-158ºF in the thickest part of the chicken breast. The temperature will continue to rise as the chicken rests (anywhere between 7-10ºF) so you want to make sure you don’t leave the chicken in the oven too long. Allow the chicken to rest for 10-12 minutes, uncovered before slicing. see the blog post for step-by-step pictures on how to spatchcock a chicken.